Beyond their size and beauty, white pines fill an important role in the environment. They grow across a range of forest conditions, especially in the northeastern half of Minnesota. Though white pines did not blanket Minnesota when European settlement began, they dotted the landscape, occurring in small groves with red pine or as individual, dominating trees. White pine brought loggers to this area in the late 1880s and provided the lumber that built the homes of our great-grandparents. Over the next 100 years, the number of white pines decreased by 75 percent. Today, people, deer, and forest pests put pressure on white pine populations. 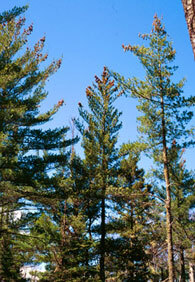 White pines usually need protection from deer, disease, insects, and competing vegetation. Planting, protection, and pruning techniques can improve survival of white pines. White pine is not a tree that can be stuck in the ground and forgotten! It needs care.